Only a few short hours south of Sydney lies a magical place ready to welcome you. Though not as well known as some of Australia’s other coastal regions, this one is a priceless treasure. This place is Jervis Bay, and it’s one of the finest places in NSW and perhaps throughout all of Australia. Natural beauty is here in abundance, with impressive wildlife, spectacular beaches, and an endless list of things to see and do. As you plan your itinerary to the area, let us help you fill your days with fun. Here is a short list of some unique things to do in Jervis Bay. Point Perpendicular is found at the tip of the Beecroft Peninsula. This lookout point is a must-see in Jervis Bay, opening up over the water for a memorable vista. Not only are the views from the point lovely, the drive itself is pretty and relaxing. At the end of the point is a lighthouse, which is no longer in use, and not open to the public, but remains a beacon of history. This small white lighthouse makes for a perfect photo opportunity, and it’s even better with the glowing sunrise in the background. Come to Point Perpendicular at dawn or dusk to catch a glimpse of heaven on earth. Perhaps it’s a rainy day or maybe it’s overly hot, but sometimes, indoor activities are a must. Take a few hours and head to the historic Huskisson Pictures. This cinema is a Jervis Bay gem, first constructed in 1913 by a local ship building family. The building was originally built as a community hall and has played several purposes over the last century. Today, it’s a cool place where you can see the latest movies. There are lots of great places to eat in Jervis Bay and surrounds, but a truly special experience, head to Paperbark Camp. 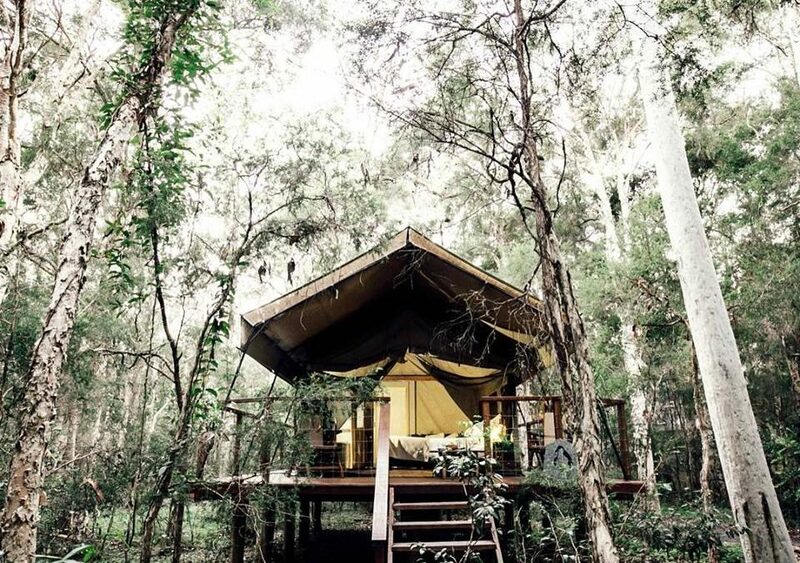 This lodging, with its patio-side The Gunyah restaurant, feels like an adult-sized treehouse! Sitting amongst the trees, you’ll enjoy a 3 course meal and frequent wildlife sightings! While the pure white sand of beaches like Hyams and Chinamans get all the attention, there’s another spot by the water which offers wonderful peace and serenity. This place is Moona Moona Creek. This inlet, jutting inland from the coast is a good spot for fishing, picnicking, or swimming/wading within the shallows. The water is still and calm, making it an ideal spot for families with young children. Low tide is a great time to explore, but high tide is swell for kayaking. Speaking of kayaking, Jervis Bay is an excellent place to do it. But if you’re after unique things to do in Jervis Bay, a standard kayak might not fit the bill. In that case, consider stand up paddle guided kayak tour. These take you and your family on a 3-hour guided tour along the coastline and through the mangroves. Wildlife sightings are a regular feature of the SUP tour, and you never know what other adventures await. We’d love you to join us on the water soon!